UX writing is to craft UI copy that helps guiding users while using a product. Buttons, error messages, menu labels and any instructions on a product usage are all what defines the UI copy. UI copy aims at providing a great experience while interacting with it. How people read the web! NN group studies have found that 79 percent of users always scanned web pages, only 16 percent read word by word. As a result, the idiom UX writing has been found. UX writing was considered a part of web content writing. But lately, it was changed from just a portion of web copy to a separate job category. It became a writing discipline of its own that helps to develop more complex and interactive functionality between platforms and devices. Clear: being specific and clear about what you are saying in the UI copy. Consistent: brand voice will help you maintain consistency. Precise: being as accurate as possible as users scan content and can’t read it word by word. Pay attention to context: UX writing is all about context and how users get what you are saying. UX writing is a super reason that would drive users to take actions through any website or mobile app. A recent Content Marketing Institute report finds that 85% of businesses polled attribute their increase in overall content marketing success to higher quality, more efficient content creation (including copywriting, video, graphics and image assets); and 72% of content strategy development. UX writers do aim at providing users with content that create a useful and helpful experience which will definitely express the brand. They also aim to enable users to understand the functions intuitively. What a UX writer is doing on interfaces is a microcopy. Microcopy defines every piece of content that users are supposed to read on any website or an app. UX writing can be the navigation buttons, images, error messages and any content that relates or speaks to users. Why is UX writing significant? Content is experience. It’s all about how you create a context in order to shape the whole experience. The user, when checking a new website or an app, all he wants is to discover it through a journey that is easy and understandable. So placing the content into an order that makes the most sense for the users or the business to accomplish tangible goals. All content types such as videos, images, and text have the ability to impact the reader’s mind. Every piece of content that is placed in the right position helps make functions easy to understand and actions to be taken. According to Uxdesign.cc, During the Google I/O 2017, Maggie Stanphill, senior UX writer at Google, explained the possible business value of having UX writers on the team. 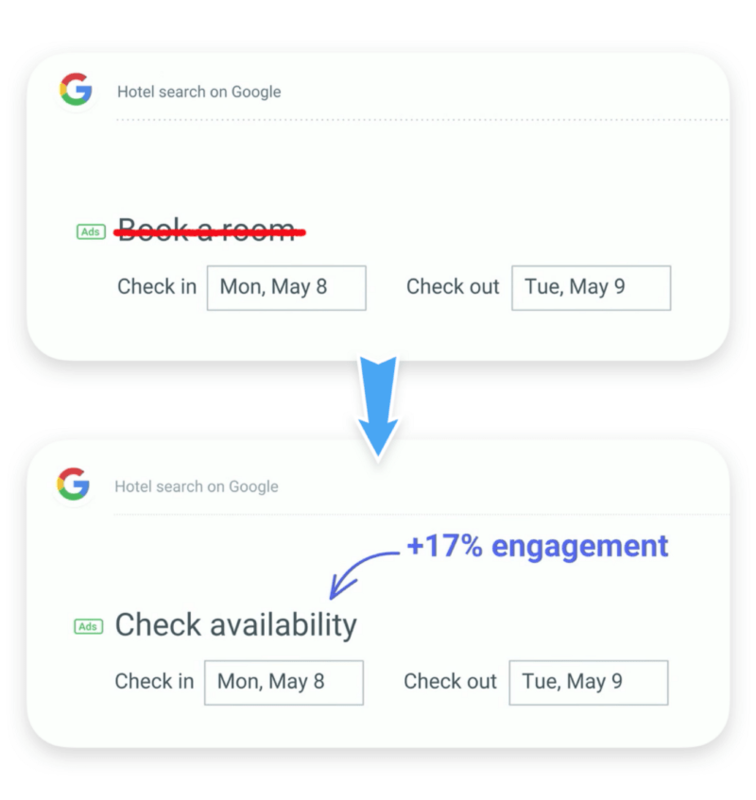 After they changed Book a room to Check availability, the engagement rate increased by 17%. UX driven product writing is not a marketing content or copy. In the next point, we will dive into the difference between them. UX writing is a part of web content writing. 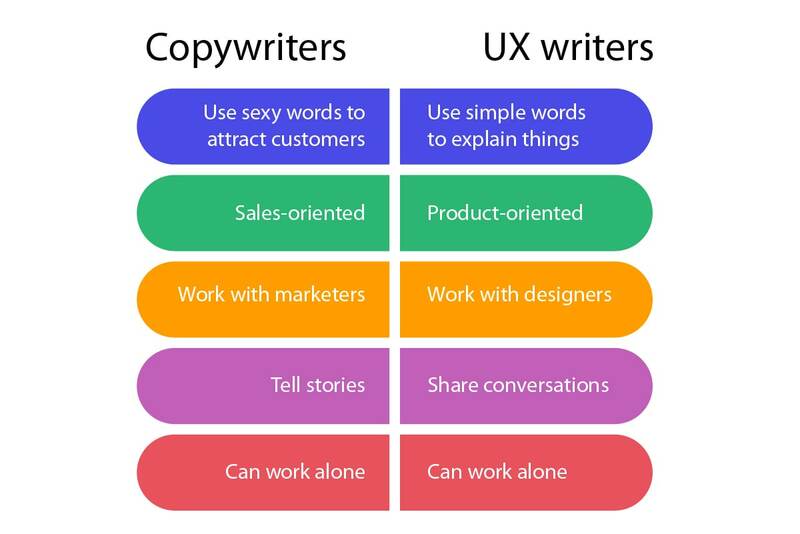 Shopify states the definition of the Ux writer in a great way, UX writers are responsible for all of the copy and content of a digital experience, both on a micro- and macro-scale. That means they’re not only dictating the broader content strategy of experience, but also hemming and hawing over the exact phrasing of a certain call-to-action or confirmation email. How things were progressed then was that designers do their work and design a product. After that, the development team makes their work to build it. Then the product is delivered to the marketing team in order to generate the content of the website. Marketing team does write the copywriting that is defined as the process of writing promotional materials that aimed to get the user to take action and to start using a product. It’s all about how to market and promote a product to make it used. But the microcopy which is written by UX writers is how to convey brand voice and shape the product experience by crafting this copy that helps users complete a task or goal. That means the microcopy will help users continue on using a product and to provide the delightful experience that will make them love to use the product more and more. This will happen once you understand your users. People browsing any product always want to be understood and to also understand the design. That will be accomplished by having a conversation with your users. When they feel they are interacting with real humans, not machines. We will discuss in deep how to make a great delightful human microcopy in the coming section. A no-brainer: the goal of having a good UX is to make users remember the experience and how they would go through the website or app funnel in order to achieve their goals or tasks. In other words, the experience should feel like intuitive. It should also be helpful, clear and enjoyable. Be concise: it doesn’t mean limited. It’s more likely to be efficient. It’s how to use as little words as possible to make sense. Always begin with objectives: when giving a user an action, mention the goal firstly so you would like to say “to start uploading files, click on the button.” not “click on the button in order to blah blah”. It means you should usually start with the objectives. Avoid long blocks of content: to help users scan text easily, chunk into smaller paragraphs and sentences. Be consistent: consistency reduces the cognitive load. Stick to the same words and idioms through the design. For example, if you used “login”, don’t use “sign in” in another position. It’s better to show users the basics first. Once they get it, allow them to view more or advanced options. That is called “Progressive Disclosure”. According to Interaction Design Foundation, Progressive disclosure is an interaction design technique that sequences information and actions across several screens in order to reduce feelings of overwhelming the user. 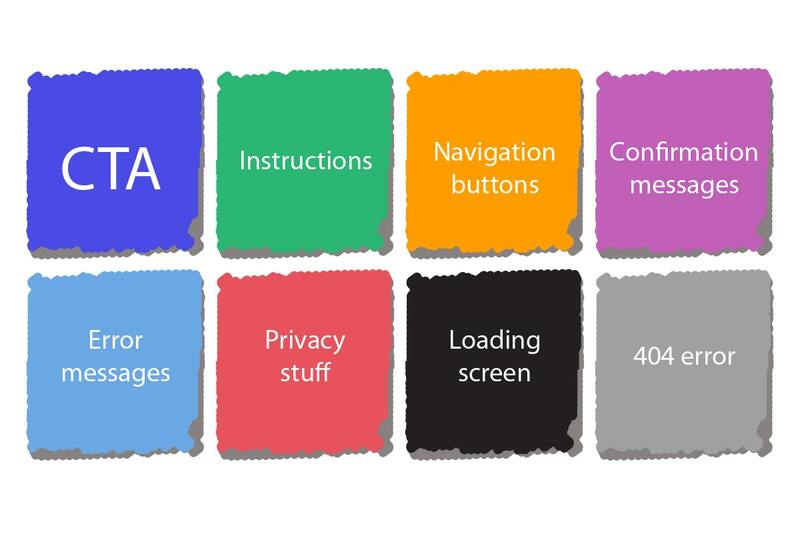 It means that make more info available within reach, but do not overwhelm the user with all features and possibilities from the first interaction. When a user needs to know more info about something, he will go through it except that he may just see the basic info. Serve as a sample of what is next. A wizard that walks the user through the task (as Nielsen defined it). It’s a step by step guide to reaching a goal. A button that leads to more advanced or detailing functions. Prioritize your words. Starting with their most important words, then the less important ones will help users to identify your goals and also theirs. Font weights, colors, contrast and capitalization, all of these will help users read easier and scan words. The call to action (CTA) guides people to their next step. You want your text to help people get where they want to go. For this reason, the call to action needs to resonate with what people want to do. Here ‘OK’ is not a good call to action. You need to always guide users to what you want them to go, but without making them feel they are being guided. Testing your copy can be at the beginning of the design process when doing the user research by asking them what words they always use. Don’t use technical words that are known to you and your team instead use human words that your users may use. Inhabit the user’s situation and try to see through their eyes. Listen to the words people use: talk about all words they may use in education, health or any related industry to your product. Notice what words they always use. Ask people to explain your words: to know how they understand your copy. And observe where they are struggling where to go through the website. Through the UX writing, you can settle a communication between users and a digital product. Here are some case studies about how microcopy has a huge impact on conversion rates. Microcopy increases conversion rates, delights users, and improve the rate of task completion. So make sure you enhance the experience through the brand tone, error messages, welcome messages, and confirmation pages.